Combine Vinegar and Soy Sauce. You need about 1 1/2 cups total for the marinade. This is not an exact science – you can put as much soy sauce and vinegar as you like. The ratio is all up to you. 1:1 ratio is always a safe bet. 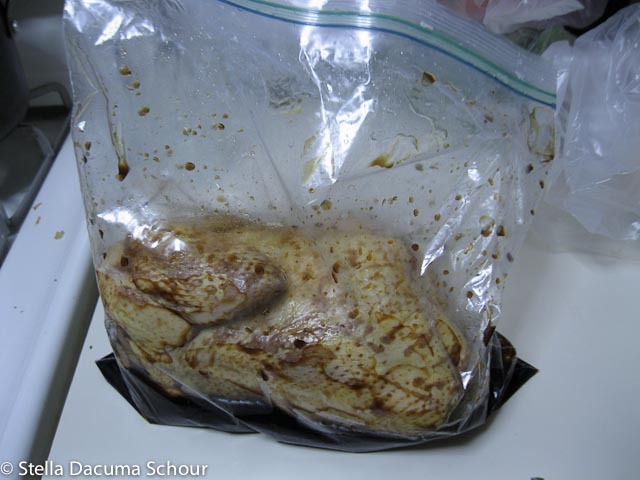 Put the chicken inside the Ziploc Bag and then pour in the Soy Sauce and Vinegar solution. Squeeze the air out and seal. Chop Tomatoes and Onion, slice lemon into rounds and halve the garlic cloves. You only need about one small onion (or two shallots) and one small tomato and 3 cloves of garlic – just enough to fit in the cavity of the chicken. 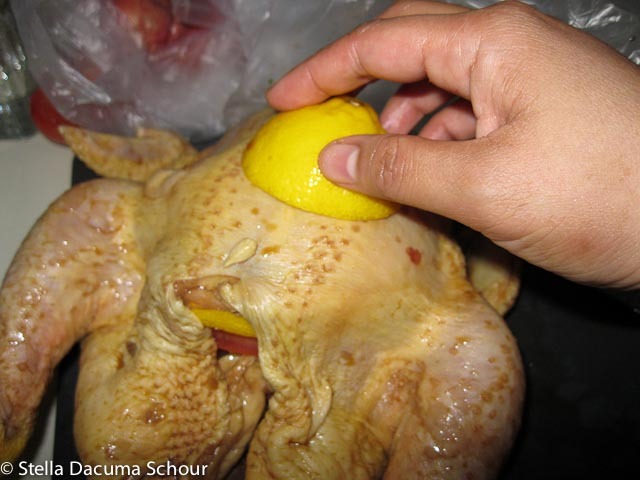 Rub a piece of garlic and lemon on the chicken skin then stuff it in the cavity. Get as much flavor as you can from your ingredients. Always. Stuff the cavity of the chicken with the chopped tomato, onion, garlic and lemon. Follow roasting instructions that came with the Turbo Oven, but remember TO TURN IT OVER halfway. If you dont, the bottom half will not cook. 3.Bake uncovered 1 hour and 15 minutes in the preheated oven, to a minimum internal temperature of 180 degrees F (82 degrees C). Remove from heat, and baste with drippings. Cover with aluminum foil, and allow to rest about 30 minutes before serving. Check out these other recipes that you can cook with your Turbo Oven! 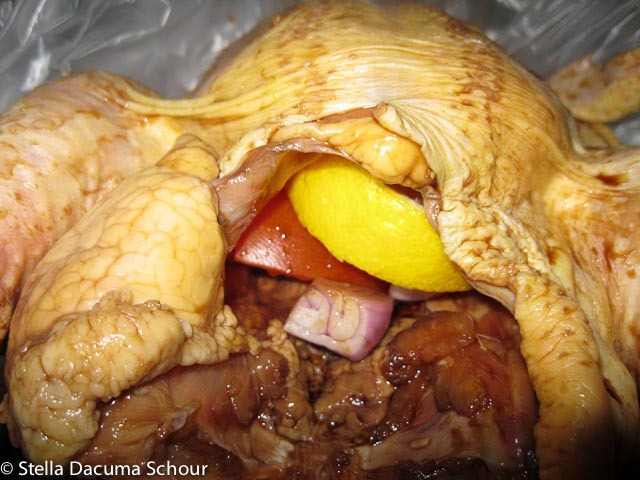 Your Turbo Chicken recipe looks really delicious! 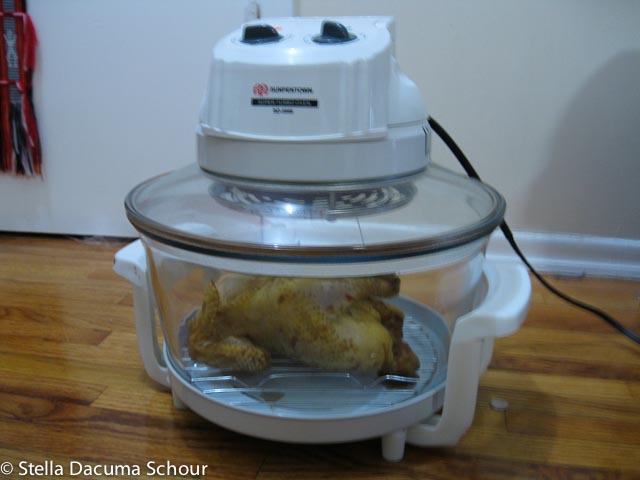 I just got a new Turbo Broiler and I will surely try out your recipe. Thanks for posting. Congrats on the new turbo! there are other turbo things in this blog. 🙂 I have another recipe, soon! I will look at your food recs, because im going to Manila next year. Mmm. Palabok!! and Thanks for visiting!